Washington Wizards All-Star guard John Wall told ESPN’s The Undefeated that he is recruiting Indiana Pacers small forward Paul George in hopes that George will push for a trade to the nation’s capital. However, with Wall leading the recruiting charge, he is hoping his buddy ends up in Washington. “I am talking to some guys — Paul. I know his ultimate goal of where he wants to be. 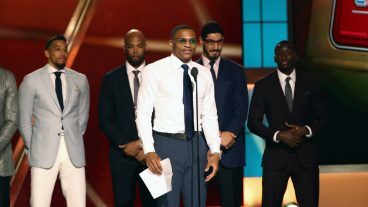 I’m trying to see if we can make something happen,” Wall told The Undefeated before the NBA awards on Monday night. Wall also believes George can help Washington get over the hump to be a title contender and could counter Cavaliers All-Star forward LeBron James. The Wizards have had trade conversations with the Pacers, a source told The Undefeated. The source added that the Pacers have been patient and that no deal with the Wizards is close at the moment.